book. "Oceanview focuses on works that exhibit a strong sense of place and setting; compelling protagonists and supporting characters; tension that builds throughout a book's narrative; seamless, gripping, and suspenseful story lines; and authenticity." While I believe all mysteries should strive for those goals, Lopez' book, with its descriptions of Siesta Key, certainly succeeds with that strong sense of place and setting. The atmospheric mystery captures Florida's Gulf Coast and the political tensions between developers and those who love the islands as they are. Dexter Vega is an unemployed reporter who picks up freelance writing jobs when he can. He actually spends a lot of time in Siesta Key and Sarasota bars, bemoaning his lack of money and work. When he gets desperate, a friendly editor throws him an idea. Bob Fleming, a wealthy retiree, is looking for someone to look into the death of his son, Liam. Once Dexter meets with Fleming, he promises him he'll check it out since the police have closed the case, calling it an accidental drowning. Fleming doesn't believe his son, a competitive swimmer, drowned in the shallow Intracoastal. When Vega is attacked by a thug at Liam's house, he suspects Bob Fleming may be onto something. Dexter's questions take him to the beaches of Siesta Key, where the beach bums and hippies who were Liam's friends swear they know nothing. But, the police report itself is suspicious. There's no written account of a witness, and Liam's missing kayak doesn't show up. How did Liam support himself? It seems he was buying up property all over the island, but no one knows who his partner was. And, Liam's friends are disappointed when they believe he was going against everything they believe in, by buying land for future development. Vega doesn't have much proof of anything, until another man is murdered. Then, drugs and thugs, lawyers and land developers and money all lead to Liam's secrets. 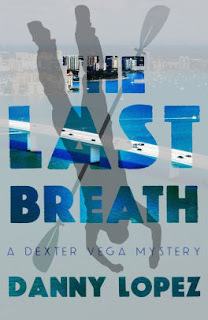 Danny Lopez' second Dexter Vega mystery is an issue-oriented, suspenseful story. It's filled with a cast of awkward misfits. In other words, it's just perfect for Florida. The Last Breath by Danny Lopez. Oceanview Publishing, 2018. ISBN 9781608092970 (hardcover), 288p.